When looking at the options available for replacing a missing tooth or a severely damaged tooth there is no doubt that dental implants are the best solution. Not only do dental implants look like a real tooth, they also feel and function as closely to a natural tooth as possible. This is a result of having the implant rooted and fused into the jawbone just like a natural tooth, something that is not accomplished with other tooth replacement options like dentures or bridges. Although it is well known that dental implants are the “gold standard” when it comes to tooth replacement options, unfortunately traditional dental implants are not always a feasible option for everyone. First of all, dental implants can be quite expensive, especially in cases where the patient will require several dental implants at once. Aside from the high cost of receiving dental implants, some patients may not have enough jawbone width or density to securely anchor the implant into place either, and not willing to undergo a bone grafting procedure. Luckily there is a second type of dental implant known as mini dental implants (MDIs) which can help patients in both of these scenarios. MDIs are similar to traditional dental implants in many ways, especially in terms of the material they are made of and the function they are intended to serve. Just like traditional dental implants, MDIs are made of medical grade titanium, allowing them to easily fuse with the jawbone that they are inserted into. The main differences between MDIs and traditional dental implants is the size, shape, insertion procedure and price associated with each. The biggest difference between MDIs and traditional dental implants is the diameter of each and the way they are structured which influences the implant procedure. Traditional dental implants are typically between 4 to 5 mm in diameter and consist of two main components; a post which is surgically inserted into the jawbone and an abutment which is the connector between the dental crown and the dental implant. MDIs, on the other hand, are less than 3 mm in diameter and instead of having two components it is one solid piece. MDIs are shaped like a tiny screw which can be directly screwed into the jawbone through the gum tissue making it a much easier procedure than inserting traditional dental implants. Another major difference between MDIs and Traditional Dental Implants is the procedure for inserting them into the patient’s jawbone. Traditional dental implants require a much more complex surgical procedure which consists of cutting the gum tissue, drilling a hole into the jawbone, inserting the implant into the hole and letting it heal by fusing with the jawbone for several months. After the healing period, a second procedure is usually required to attach the abutment and crown to finalize the procedure. Since MDIs are shaped like a tiny screw, there is no need for cutting the gum tissue or drilling a hole into the jawbone. Instead, MDIs are screwed directly into the jawbone straight through the gum tissue. This allows for a much quicker, less invasive surgery which heals much quicker than traditional implants. When looking at price, there is no doubt that MDIs are much less costly than traditional dental implants, sometimes by more than 50% cheaper. This is not only a result of MDIs being smaller in size than traditional dental implants, but also due to the fact that the procedure for placing them is much easier and less time consuming. What About The Durability Of MDIs? 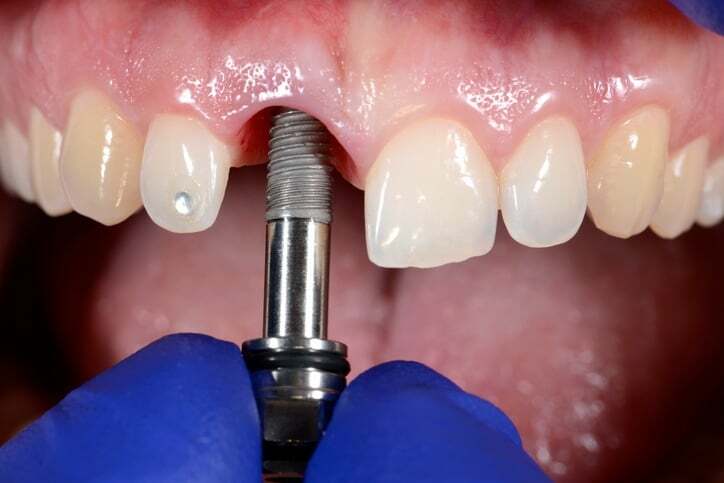 There is much debate when comparing the durability of traditional dental implants to MDIs. Most tests have shown that the strength of an implant is determined by its length and not its diameter. Since the length of both types of dental implants is comparable, there should, in theory, be no difference in their strength or durability. Some dentists disagree with these findings and feel that traditional dental implants are much more suitable for withstanding strong chewing forces, thus using traditional dental implants to replace molars. This may also just be due to the fact that traditional dental implants have been around for much longer than MDIs so the success rate of both still can not be accurately compared. Are MDIs Ever The Better Choice? 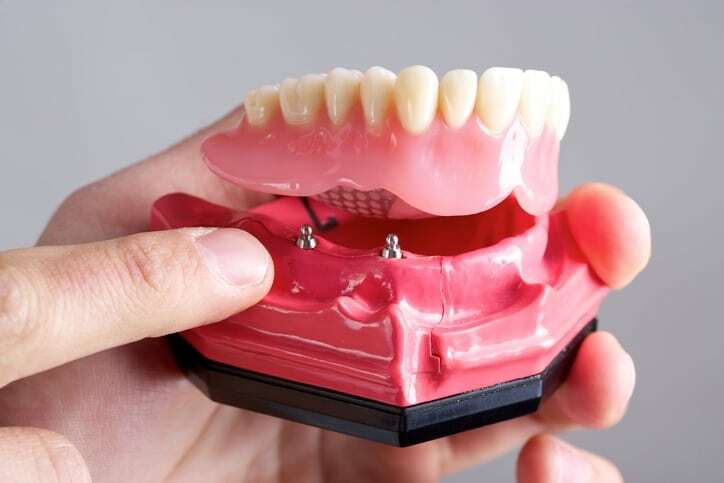 Aside from the obvious benefits of having a lower cost and simplified procedure, there are several other scenarios that MDIs may be preferential to use than traditional dental implants. One such scenario is if a patient’s jawbone width is too narrow to support traditional dental implants. In this case it would be much easier to insert an MDI into the deteriorate jawbone instead of having the patient undergo a bone grafting operation prior to having dental implants inserted. Another common scenario where MDIs are prefered is when placing multiple dental implants at once such as during an all-on-4 dental implant procedure. In this case it would be significantly more cost effective to use MDIs for anchoring the permanent denture than having to surgically insert multiple full size dental implants.